Tackling toys to many is not a tiny area! But if you tackle it in one hour segments, it gets the job done! Kids play with toys when they are not ovewhelmed by the quantity. Think about a kindergarten classroom. There are 25 kids and not even 25 toys. So less is more in this space. If you have new toys, you can save them for holiday toy drives. If you have missing parts, just keep a bin of all strays until the parts are rounded up. Summer is great time to organize this area with your kid’s help. This is a teachable skill to be organized and to declutter. Have black garbage bags with you and your timer. Invite your kids to help and set the timer for 15 minutes. In that time, ask your kids to donate what they don’t love, what they want to share with others, and what is no longer age appropriate. Drop these into the bags, filling only until easily carried to the car. Have your kids drop off the items with you. Set your timer for 15 more minutes, 3 more times, working around the room. At the end of the sessions, bring the items to the car and be sure to drop them off later that day. You may have a few keepsake toys to store. Purchase 66 quart bins, with latches to secure closing, to store in the attic. How many hours will this take? I suggest 2, 3 or 4 one hour sessions to get the job done. Breaking this job into small units makes it happen. Organizing a kid friendly space means having them have access to their toys. Here are two creative resources for you to use. Busy Boxes from Container Store make rolling toy bins with different size containers. IKEA has Trofast tiered units to help organize toys. Remember to label to keep your toys systems and storage in order. Pictures are a great way to label too! You have a year (or more) of your child’s homework, art work and photos. Your kids have worked hard and it is a challenge to let go of what seems like an overwhelming quantity of art, papers, and work. This is a great time to evaluate what to keep and what to let go. Kid art may not seem like a tiny area, but making this a manageable one hour project will help you move forward. Start by defining what you know to be precious to you. Is it a hand print? Is it the first 100 on a paper? If you know what you find more important, then it is easier to make a decision. Define what quantity of precious items you want and also where you will store the items. Kids keepsakes can be stored at the top of their closets, marked in a box by year. Eliminate the “junk” now by recycling the paper, but be sure it is not where your child can see it. Take pictures of the art work, especially any with food items, and create a digital scrapbook of the year’s artwork. Separate out the year’s school and athletic photos. Use clear slip in pages and keep the baseball, school, and other 8 by 10 photos in this notebook. Have fun with this tiny area! Ask your child to pull 10 items that they love! Be sure to label the year, and the school year. I would love to learn how your art tackling is coming! Look out Good Housekeeping and Real Simple, there’s a new cowgirl in town. We all love our magazines where we pull out important articles, recipes to try and beautiful interiors to copy in our home. With the new social network Pinterest, we can search online for all these and have easy access whenever we want to look for something new. No need for magazines to enjoy this fun! 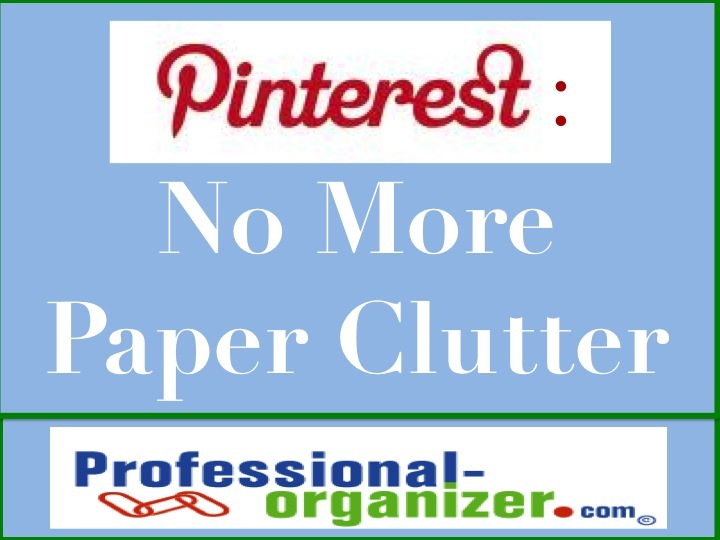 No more paper clutter! Pinterest was started with the idea of sharing. It is really a tool for women who love to see and experience. With Pinterest, you create categories on “boards” that are shared with friends. Pinterest eliminates your need for paper clutter by creating these boards. Word of warning, that Pinterest can be addicting! You are jumping to lots of new websites, with lots to see. So set your timer for 15 minutes to be able to hop off. So it may be time for you to start eliminating paper, using this new digital technology. It can be loaded onto your ipad, tablet or slate to take it with you too! You can search to star new boards with the easy search tool too! If you want to get started on Pinterest, please email me to send you an invitation. Pinterest is by invitation, but it is for everyone. View my boards at www.pinterest.com/EllenDelap. Small steps lead to big accomplishments! Tackling a tiny area can make a difference in your home or office. This summer we are taking a tour of these projects and creating a plan for you. This project is the laundry room. Laundry is an important process in our homes and for ourselves and our family. Having a well stocked, efficient space makes it easy to get this job done. Set your timer for one hour. Eliminate trash first, then recycle plastic containers. Pull out the items that are unused and donate these. With the items that remain, group these together by categories, such as lightbulbs, cleaning, glue and tape, pets, and laundry. Decide if items truly belong in the garage and distribute these at the end of your hour. Even a laundry room can be a place of beauty! Uniform, attractive containers make the difference. Label the containers to help you and your family maintain order. Think about painting the walls a color you love too! Laundry stuck in this room forever? Invite your family to the “laundry party” and purchase one laundry basket per person. This way you can distribute laundry to each person’s room effortlessly, with each person putting away their own laundry. If laundry is leaving and not getting put away in your kid’s room, have them watch a movie, fold and put on hangers, and then set a timer for 5 minutes to put it away. Give your family a deadline and a date to get this done every week. What ways are you tackling your laundry area? Here is it, the first week of summer vacation. Its time to start a new routine for you and your family, transitioning to ways your family can make the most of summer. Summer routines start now! Have a family meeting where you talk about what summer means to each family member. Talk about how you can be a team this summer and about each person’s growth. It can be working together on a family project or fun activities. For individuals, it can be becoming a better reader, building more confidence with math (for parents this is balancing your checkbook), taking on a new challenging sport (I see moms who are becoming triathaletes), or just deciding you are going to have more family time together. Write up a checklist for your kids to accomplish each day, including chores and their chosen challenge. Decide on a completion time for the checklist, so without controversy and conversation it is done. Establish a bedtime for parents and kids this summer, including curfews for older kids. Starting your summer routine also requires commitment. If these routines do not go as planned, press the “reset button” and start again the next day. 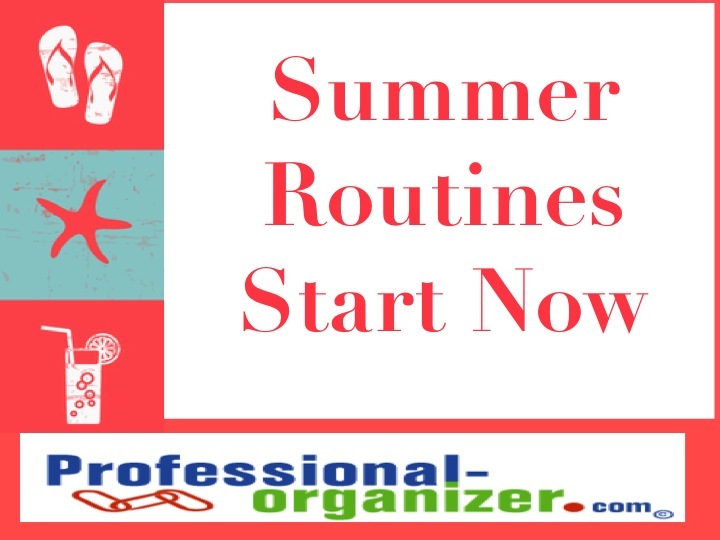 What routines are you starting this summer? Join me for summer fun! https://professional-organizer.com/WordPress/wp-content/uploads/2016/07/logo.png 0 0 Ellen https://professional-organizer.com/WordPress/wp-content/uploads/2016/07/logo.png Ellen2012-06-03 08:32:252014-06-18 18:26:27Summer Routines start NOW! Small steps lead to big accomplishments! Tackling a tiny area can make a difference in your home or office. This summer we are taking a tour of these projects and creating a plan for you. This project is the linen closet. It starts out as just a small mistep. You are in a hurry and drop your towel on the floor. Then company is coming and you swoosh it into the linen closet. Then you don’t know what to do with something in your room, so you open the linen closet and drop in something totally random. And then you are so overwhelmed each time you open the door, how you could ever get organized? How do you tackle this tiny area? Set your timer for one hour! Have 2 garbage bags ready, one to drop in what is to be donated and one that is for trash. Start at the top shelf, taking each item out and deciding what to do with it. If you are keeping it, establish categories like first aid, medications, body wash, make up, travel, and any others. Any items that need to be distributed to the rest of your home, start a group by the door just for distribution. Once you have decided what to keep, decide what will keep these categories together. Is it a functional clear plastic shoe box or a pretty wicker tote? Now you know how many to buy, so measure your space. You can order online at Amazon or make a quick trip to a local store to purchase these items. Remember you will be labeling this container to maintain order too. Tackling this tiny area has big rewards! Now you now what you have, you can easily find it rather than purchase duplicates, and your success will push you forward in the next area you tackle! Let me know how your baby steps in organizing is coming along!